Somali pirates are understood to have hijacked the British-managed MV Ariana and its 24-strong Ukrainian crew. The vessel was captured off the coast of the Seychelles in the early hours on Saturday morning. Owned in Greece by All Oceans Shipping, the vessel is Maltese flagged and managed by London-based Seven Seas Maritime. The vessel was understood to have been carrying 35,000MT of soybeans from Brazil to the Middle East. Stan Rankin has already been spotted at Mogadishu airport! May corn closed at $4.06 ¼, up 10 cents. Strong buying came in during the last hour of trade to take corn to new daily highs. Another belt of rain is set to hit much of the corn belt Saturday/Sunday/Monday which will keep field progress to a minimum. The USDA will release its latest planting progress report Monday night, with traders expecting the crop to be only around 30-35% seeded, compared to a five year average of 58% done. Spillover strength from soybeans and wheat also helped corn today, as too did firmer crude oil. May soybeans closed at $11.02, up 32 cents, breaking through the $11 mark as China continues to buy US beans at an aggressive pace. The government there announced that it would continue to shore up the domestic market by buying a further 1.25 MMT of soybeans from Chinese farmers. With supply worries remaining over Argentina, this should keep Chinese crushers coming back for more US beans for a little while longer yet. Meanwhile, in addition to its logistical problems, the Argentine crop keeps shrinking, now only expected to yield 32-34 MMT, sharply down from early season hopes of 50 MMT. May CBOT wheat finished at $5.57 ¼, up 33 cents. Spring wheat planting progress is severely behind schedule, with traders calling Monday night's USDA report to show around 20-24% complete, compared to 58% normally at this time of year. North Dakota, don't even go there sister, the largest spring wheat producing state in the US by a country mile was just 1% planted as of last Monday. For winter wheat Oklahoma & Texas crops are also looking like a disaster area, with a sharp frost at the beginning of April decimating potential yield there. Crop concerns in Russia and the Ukraine are also now surfacing. EU wheat futures closed higher Friday, buoyed by sharply firmer US markets late in the day. London November feed wheat closed up GBP1.75 at GBP124.00/tonne, whilst Paris May milling wheat was EUR1.50 higher at EUR142.00/tonne. US wheat futures were sharply higher late in the session, which added support despite a weaker US dollar. Severe planting disruptions to US spring wheat in North Dakota, which accounts for almost half of all US spring wheat production, are seen as supportive. Talk of dryness issues in Russia and Ukraine potentially affecting winter wheat yields there was also bullish for wheat. In the EU France, Germany and the UK have all had a much drier than normal last three months. Although rains have been fairly widespread this past few days, much more is needed to get back to normal precipitation levels for this time of year. EU farmers remain reluctant sellers at current levels, preferring to adopt a wait and see attitude. With the existing premiums to be had for new crop over old crop who can blame them? The overnights closed mixed with wheat 3-5 cents higher, corn up 1-2 cents and beans around unchanged levels. Nothing much to get too excited about there, it's been a roller coaster ride this week with panic selling on Monday seen by many as a buying opportunity. For soybeans China is still the major market influence, taking more than half of the USDA's weekly export sales yesterday. The Chinese government have said that they will continue to support domestic prices by increasing it's purchases from farmers from 6 MMT to 7.25 MMT, which may stimulate even further import activity from crushers, despite high stock levels. There are some who think that Chinese demand is a massive pack of cards waiting to collapse, and they could be right. The WHO has officially now stopped calling swine flu swine flu, it's just flu now. Mexican fatality and hospital admission rates are falling. My stepdaughter (aged 12) came home from school yesterday saying that there were 20 confirmed cases in nearby York and that schools there were closing left right & centre and that we were surely next, what would we do if we all caught it, everyone at school is really worried etc. Of course it's all a load of baloney, but I guess that school kids believe all this stuff. The Egyptians appear to be using the scare to con the masses into a nationwide pig-cull, much to the angst of the pig-keeping Christian minority. Spring wheat planting in North Dakota just can't seem to get going. They've had an inch of rain this week, and with temperatures forecast to do no better than nudge into the 60's over the weekend soggy fields aren't going to be doing much drying out just yet. Early calls for this afternoon's CBOT session: Corn called steady to 2 higher; soybeans called flat to 1 higher; wheat called 3 to 6 higher. Egypt has announced plans to cull the entire national pig herd of around 250-350,000 head in the wake of the swine flu outbreak. At first casual glance that sounds bearish for soy doesn't it? Well, there's a bit more to it than meets the eye. The country's pig population largely belongs to the Christian minority living in slum areas around Cairo. Suffice to say that they don't get a lot of high protein soymeal in their diet. The swine flu outbreak in Mexico has been seized upon by the government as a convenient excuse to rid the country of what the Muslim majority regard as unclean pests. Christian farmers blocked streets and stoned vehicles of Health Ministry workers who came to carry out the government's order. The state-owned Al-Ahram daily said that a farmer at an undisclosed location had been caught with 300 pigs as he tried to smuggle them to freedom on Wednesday. Armed police have been stationed huffing and puffing outside some of Cairo's pig sties to prevent such incidents. Farmers in Eastern Australia have begun planting winter wheat after most of South Australia, Victoria and southern New South Wales received decent rainfall totals in the last week of April. After a week of near record cold temperatures southeastern Australia can expect milder weather to develop during the weekend, forecasters say. On Friday morning temperatures plummeted as much as seven degrees below the May average in Victoria and NSW. While the east of the country is rugged up in near freezing temperatures, the west coast is enjoying sunny and warm weather more typical of mid summer. Perth is set to record at least six days in a row of plus 25 degree temperatures only weeks out from winter. The spell could easily last until late next week which will be the longest stretch of plus 25 degree May days for Perth in at least 46 years. This warm and dry pattern in Western Australia, which produces around 40-45% of the country's wheat, will keep farmers in the state sitting on their hands for a week or two yet. Many areas of the WA wheat belt had just 10mm or less rainfall during April. Argentina's 2009 wheat crop is already under threat before it's even in the ground. With plantings forecast to drop by around 20% due to a combination of drought, lack of credit and farmer dissatisfaction with government tinkering 2008 production of just 8.3 MMT could be lowered further, a far cry from the 16 MMT produced in 2007. Considering how dry it is, it will take copious rainfall to properly recharge soil profiles, say StormX. Rainfall deficits up to 300 millimeters (12 inches) built up from January through March in Buenos Aires, the leading wheat province that grows nearly two-thirds of the national wheat crop. 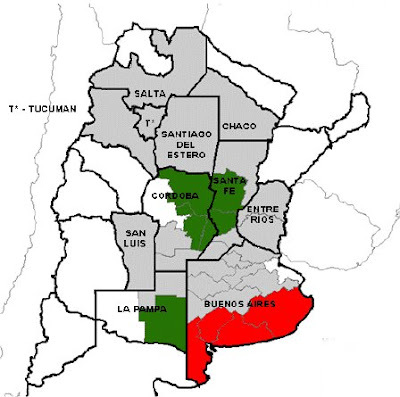 The Buenos Aires Grain Exchange said last week that insufficient rainfall across Argentina’s Pampas over the past month has led to drought conditions across much of the farm belt, which may have a serious effect on wheat planting, add StormX. Conditions are so dry in the southern areas that wind is carrying away topsoil, “a true ecological disaster.” The mid April vegetation index verified extreme drought conditions in Buenos Aires and La Pampa. May corn closed at $3.96 ¼, up 3 ¼ cents. Outside markets were steady today, which helped the cause for corn. The weather outlook is still pretty cool & wet which may delay plantings a little. The 6 to 10 day forecast shows above normal precipitation through May 10th for states east of the Missouri River all the way to the east coast from the Gulf to the Canadian border on already saturated soils in the Ohio River valley. Export sales were strong again at 1,225,200 MT and 116,000 MT for delivery in 2009/10. In addition South Korea bought 220,000 MT of corn overnight. May soybeans closed at $10.70, up 36 cents. China announced it will expand soybean reserves from 6 to 7.25 MMT, and confirmed their presence in the export market by booking 468,400 MT of old crop beans in the USDA's weekly export sales report. The impressive pace of US export sales & shipments should further tighten old crop ending stocks in next month's USDA report. Also supportive was the Buenos Aires Grain Exchange dropping its Argy crop estimate to 34 MMT, with some private analysts now citing a crop of just 32 MMT. May CBOT wheat finished at $5.24 ¼, up 3 ½ cents. Flooding in Kansas and North Dakota is a concern for both winter and spring wheat, both states are the largest US producers for each commodity respectively. As much as six times the normal amount of precipitation has fallen in parts of Kansas, Oklahoma and Texas in the past month. Canada revised its 2009 production estimates saying that non-durum wheat production will fall 10% to 20.8 MMT. Largely dry conditions over the next three months in Argentina will have an negative impact on wheat plantings there, which are already forecast 19% lower. EU wheat futures closed Thursday steady to slightly higher supported by firmer US grains and outside markets. The early week panic over swine flu seems to have disappeared as the trade disassociates itself from the threat of the spread of the disease and its link with pigs and/or feed demand. Although Egypt reportedly ordered the slaughter of the country's entire pig herd, there is a lot more to this story than meets the eye. More on that elsewhere on the blog tomorrow. Meanwhile the weather in Argentina keeps on reducing the soybean crop there, with private estimates now as low as 32 MMT. In addition, wheat planting will soon begin, the ongoing drought will do little to encourage farmers to plant more, especially given the governments stance on export licences. Egypt bought 60,000 MT of Canadian wheat, passing on more expensive EU grain. eCBOT grains closed higher on the overnights with beans up around 12-14 cents, corn a couple of cents firmer and wheat up 3-5 cents. The Buenos Aires Grain Exchange dropped its estimate for the 2009 Argy soybean crop to 34 MMT, with some private analysts now saying 32 MMT, that's a far cry from early season hopes of a 50 MMT crop. The brutal drought looks set to continue and could easily trim another 2-3 MMT off current estimates with around a third of the crop still to harvest. There are some reports of an early frost having done some damage in the last couple of days too, just to add insult to injury. The acute dryness will also begin to affect wheat planting intentions, which are already pegged 19% lower. Weekly export sales for soybeans were impressive yet again at 834,600 MT for old crop and 335,500 MT for 2009/10. China took 468,400 MT of the old crop sales with a further 165,100 MT going to unknown destinations. Meal sales were bullish too at 293,000 MT, a marketing-year high. Corn sales were also strong at 1,225,200 MT and 116,000 MT for delivery in 2009/10. In addition South Korea bought 220,000 MT of corn overnight. Wheat sales were not so bright at 142,400 MT for old crop and 18,000 MT for new crop. Early calls for this afternoon's CBOT session: Corn futures are expected to open 2 to 4 higher; soybeans 10 to 15 higher; wheat 3 to 5 higher. The Buenos Aires Cereals Exchange lowered its 2009 Argentine soybean harvest estimate down to 34 MMT last night. We have to ask ourselves where on earth would we be without the February rains that were hailed as "drought busting" by some analysts? Private firms in Argentina are now forecasting production to be 32 MMT, compared to last year’s 46.2 MMT production. As the drought continues, this number may fall even more. The map below shows the drought that has worsened over the past 3 weeks over major soybean areas in Argentina, warn StormX. Latest computer guidance indicates the soybean areas will not see any rain through early next week, say StormX. By next Wednesday, a few showers may work into the region, but the Cereals Exchange expects overall dry conditions to now persist for the next three months. Officials in Buenos Aires are reporting significant erosion occurring in parts of the province leading to what the are deeming an “ecological disaster” they conclude. Largely dry conditions over the next three months will also have an negative impact on wheat plantings, which are already forecast 19% lower, and the early development of the crop. The fifth largest wheat exporter in the world in recent years may already face the ignominious prospect of now having to import wheat to cover its needs this year. It's early days, but it doesn't look like things are going to get much better for the 2009 crop which will be harvested Nov/Dec. Robert Wiseman Dairies are to cut the price they pay their milk producers by 1ppl to 24.02ppl from 1st May. They have at least said that they will maintain this price up until the end of July. It will be interesting to see what the other leading milk buyers do. The market finally seems to have woken up to the fact that the "world-wide pandemic" of swine flu is in reality far less dangerous than many in the media would have us believe. In fact swine flu is responsible for far fewer deaths than normal influenza which kills 400,000 people globally every year, of which 36,000 are in the US. More than 200,000 people are hospitalised by "normal" influenza every year, according to the US Centre for Disease Control and Prevention. "It’s a situation where we should be cautious but not panicky," said Susan Rehm, medical director for the National Foundation for Infectious Diseases. "From what we understand so far, the severity doesn’t seem to be much different than what it is in regular seasonal influenza," Rehm said. The Buenos Aires Grain Exchange last night slashed its Argy soybean crop estimate to 34 MMT, from 36.2 MMT last week, and now fully 5 MMT lower than the USDA's most recent estimate. The Argy Agricultural Secretariat crucially still hasn't issued a current estimate, having pulled it's March figure within hours of its release last month. The crop is 66% harvested according to them, curious that they can put a figure on harvest completion but not crop size. EU wheat futures closed higher Wednesday as the initial panic over demand concerns related to the swine flu outbreak in Mexico subsided. Outside markets provided underlying support with crude oil and Europeana and Asian stock markets also higher. Paris May milling wheat closed up EUR1.50 at EUR140.75/tonne, and London November feed wheat ended up GBP1.35 at GBP122.25/tonne. Cold and wet weather is hindering US spring wheat plantings, especially in the important state of North Dakota which produces almost half of all US spring wheat. The crop there is just 1% planted as of Sunday according to the USDA. The US has become the first country to report a death from swine flu outside of Mexico. A twenty-three month old infant has died from swine flu in Texas, according to breaking news reports. A spokesman for the US Centre for Disease Control and Prevention confirmed the death to CNN but gave no further details. There are currently 66 confirmed cases of the disease in America. The CDCP says that about 36,000 people a year die of flu-related causes in the US. The overnight eCBOT market closed firmer with soybeans up 13-15 cents, wheat around 5-6 cents higher and corn up around 3 cents. The rally can largely be attributed to a feeling that Monday's selling was panicking in the light of the media-hyped "world-wide pandemic" of swine flu. In the cold (nice pun, Nogger) light of day is it really going to effect feed demand that much? Probably not. Of more concern I'd say are stories this morning of China cancelling US bean purchases. The market has kind of got used to China being an ever-present during the first four months of 2009, what happens if they simply go away? Wet and cold weather is seen hampering farmers attempts to get a lot more corn into the ground this week in the US corn belt. But at 22% planted already things aren't looking too bad for corn. If things are looking bad for anything it's wheat. Winter wheat conditions in Oklahoma are dire, and spring wheat plantings in North Dakota are virtually non-existent. A sharply lower dollar and firmer crude oil and Asian & European stock markets are supportive to the entire complex. The early call on this afternoon's CBOT session: Corn futures expected to open 2 to 3 higher; soybeans 13 to 15 higher; wheat 5 to 6 higher. Rumours are circulating in the market this morning of the cancellation of 4-5 cargoes of old crop US soybean sales by China. The country's commerce ministry warned only last week that Chinese buyers should "adjust their import pace to avoid excessive imports which may cause losses." China has been buying and importing soybeans and rapeseed at an aggressive pace so far during 2009, and is likely to ship in almost 4 MMT of soybeans during April. "China has bought too much, and imports are already sufficient to meet demand. We do not expect companies to continue to buy such a large amount," said one analyst with the China National Grain and Oils Information Centre (CNGOIC). It will be very interesting to see if tomorrow's weekly export sales report from the USDA confirms any of this. Last weeks soybean sales were 617,100 MT for old crop and a very healthy 824,200 MT for new crop. China booked 186,300 MT of old crop and 232,500 MT of new crop, there were also new crop sales of 582,000 MT to "unknown" which often translates as China. The UK's one and only wind farm manufacturing plant is to close due to lack of orders, reports the Guardian. The plant, owned by Vestas, the world's biggest wind energy group, in Newport on the Isle of Wight employs around a not insignificant for the local economy 700 people. One of the biggest stumbling blocks to building domestic wind farms is the enormous amount of red tape involved in obtaining planning permission, which is an extremely complicated and laborious process, said a Vestas spokesman. The government's promises to "go green" on energy production look like a lot of hot air when the chips are down it would seem. I think I might be getting a little bit twitchy right now if I'd invested hundreds of millions of pounds in developing UK biofuel plants that haven't even been fired up yet. Which of the UK's big four saw biggest growth the in the 12 weeks to April 19 compared with the same period last year? The answer, somewhat surprisingly, is Sainsbury's according to figures from TNS Worldpanel. Sainsbugs chipped in with growth of 8.1% during the period, eclipsing Asda with 8% and Morrison's with 7.4% in a sector that saw overall growth of 6.2%. Tesco, Britain's largest supermarket, only managed growth of 4.6% during the period. Food price inflation during the period was 9% say TNS. Why this should be when commodity prices at farmgate level are declining? That's down to the weakness of the pound they helpfully explain. Except that twelve weeks prior to April 19 the pound was worth less than $1.40 against the dollar, compared to around $1.46 by the end of the period. So it must be the weakness of the pound against the euro they mean, right? Erm, no wrong again, at the start of the period one euro was worth 94 pence, by April 19 that had fallen to around 89p. So they're lying then, retail food prices went up during the period despite the pound improving, whilst wholesale prices fell and the supermarkets lined their pockets all behind a thin smokescreen of "we're doing our best to help the consumer during this difficult time" bollox? Well that's one of putting it, yes! "Swine Flu Spreads to Hundreds in New York as Global Pandemic Threat Climbs," says the headline on Bloomberg this morning. The article goes on to tell us that there are 45 cases in New York, mostly at the St. Francis Preparatory School in Queens where "82 students have called in sick." The New Zealand "outbreak" was also amongst a group of students was it not? Are we spotting a trend yet? "I know I've just had a three week field trip to Mexico Mummy, but I've got a sore throat & a tickly cough. I think I may need a few weeks observation on the settee in front of Tricia and Jerry Springer before I go back to school. And besides all the teachers hate me, and the kids call me names." "There there my pet lamb, lets get you down to hospital straight away, I'll buy you some Lucozade and some of those cough sweets you like on the way. But you'll have to go back eventually you know my precious one, you are the Geography teacher." Workshy Students Drive Commodity Prices Lower, that would be a better headline. During April 1-24, 2009, grain exports from Russia totaled 1.46 MMT, including 1.14 MMT of wheat and 322,000 MT of barley, say the Ministry of Agriculture of the Russian Federation. This brings total grain exports for the current July-June marketing year to 17.66 MMT, of which 15.52 MMT was wheat. This is well ahead of the 2007/08 export pace when Russia exported 13 MMT of grain in the whole marketing year, including 11.6 MMT of wheat. It also eclipses the previous record of 15.8 MMT shipped in the whole of 2002/03, and leaves the country on track to export up to 20 MMT by the end of the marketing year on Jun 30. Domestic wheat prices were a little higher last week at around $182 (GBP124.50) per tonne, basis Krasnodar, according to the Institute for Agricultural Market Studies (IKAR). Meanwhile feed barley traded at around $142 (GBP97) per tonne, they added. VION Foods have announced more job losses with the closure of of its processing and slicing operation at Ashton under Lyne and transfer the bacon curing business to its operation in Malton, and slicing business moving to its facilities in Scunthorpe. The Ashton facility employs around 380 people and Vion said it was now entering a period of consultation with staff to explore ways to avoid redundancies, including transfers within the business. Workers were informed about the closure in meetings on Monday afternoon. A review of the company was announced after it took over Grampian Foods last year but Union bosses say the closure is a huge shock. The announcement follows on from news earlier in the year in which Vion announced it would be axing around 820 jobs, with jobs being cut at Malton and Haverhill. May corn ended at $3.75, up 2 ¾ cents. Corn basis is firm with farmers focused on the new crop instead of selling the old for now. Weather models are calling for cooler temps in the southern and eastern corn belt into Oklahoma and Texas as the result of a more progressive and southerly storm track with warmer temps in the Northern Plains. That does translate into a little less moisture in the northern and western portions of the Corn Belt, compared to previous forecast runs. Plantings were not as far behind as many had expected according to the USDA Monday. May soybeans closed at $9.89 ½, down 15 ¼ cents. Swine flu dragged prices lower, with concern over demand the overwhelmingly bearish factor. Plantings are in line with expectations, corn was not as far behind as many had expected yesterday which explains new crop months clawing a little of the inverse differential back. South American crop still seem to have the potential to work lower. Oil World lowered its crop production estimates for Argentina, Brazil and Paraguay citing lower than expected yields as harvest progresses. May CBOT wheat closed at $5.10 ½, up 2 ½ cents. Crop damage from the April freeze is continually revealed as the growing season progresses, with Oklahoma particularly badly affected. Better planting conditions are in the forecast for northern spring wheat which will bring some relief to producers in that area, however, the later the grain is planted the more concern there is for yield. The Mexican swine flu outbreak is keeping the trade on the defensive, despite widespread protestations that the disease cannot be spread by human consumption of pork. Spring wheat plantings in the US are running well behind schedule, which is also mildly supportive. Fairly widespread rains across the UK and France are bearish for EU wheat however. As the Argentine soybean crop approaches the finishing line it reminds me of that famous Olympic incident with the marathon runner almost having to be helped across the line many years ago, his legs all wobbling from under him. It is also interesting to note from this image how bad things are in Paraguay to the north of the marked area, and also in western parts of RGdS in Brazil to the upper right of the box. In addition, you have to consider the implications for winter wheat planting in Argentina, which will be getting underway any day now. North Dakota is the largest spring wheat producing state in the US, accounting for almost half of the nation's entire crop in a normal year, but this year is far from normal. Excessive flooding early in the year means that spring wheat planting in the state was just 1% complete as of Sunday, according to the USDA. that figure compares to 28% completed a year ago and the five year average of 29%. By Wednesday night, more showers are possible, keeping fields damp and further hindering planting progress. A report in today's Wall St Journal says that Bank of America and Citigroup, who have already received $45 billion each in government bailout funds, have been told by regulators that "stress test" results show they may need to raise additional capital. Apparently, executives of both banks are disputing the regulators findings, but then again they would wouldn't they? Citigroup's shares are down 88% in the past year whilst BoA's are down 75%. eCBOT grains closed a choppy overnight session mixed with soybeans 9-10 cents higher, wheat up 5-6 cents and corn down 2-3 cents. The market can't seem to make it's mind up about swine flu today, beans opened a couple of cents firmer, before setting contract highs early in the session. By 6am BST prices were back in negative territory and stayed there for most of the morning, before rallying again late on. The media hype over the recent outbreak of swine flu in Mexico certainly caused a strong reaction in the markets yesterday. The BBC report today that the "death toll" has risen to 152, from 149 last night, so it's not exactly racing away. And of this total only 20 are confirmed swine flu deaths. In addition the BBC report the number of new cases reported by Mexico's largest government hospitals had declined during the past three days: from 141 on Saturday to 119 on Sunday and 110 on Monday. Whilst cases, or suspected cases, are being reported around the world, we are talking very small numbers here, and almost all of them mild. Two in the UK, one in Spain etc., there are more people dying every day of a lot more things to be worried about other than swine flu it would seem. China, amongst a handful of others, have banned imports of US pork for the time being, but they import less than 1% of their pork from America anyway. Last night's planting progress report appears to show some fair progress was made for corn with 22% of the US crop now planted. The numbers show a marked difference between East and West, with states like Iowa and Minnesota 47% & 40% done respectively, but Illinois and Ohio lagging at just 4% and 2% planted. Soybeans were 3% planted, in line with expectations and only slightly behind the 5 year average. Spring wheat however continues to lag at 15% planted compared to the five year average of 36%. Additionally top producing spring wheat state of North Dakota is just 1% done compared to 28% a year ago. Meanwhile Oklahoma winter wheat conditions have been hit badly by the Apr 7 freeze, 64% of the crop there is now rated poor-very poor. Japan are tendering for 156,000 MT of wheat this week with 114,000 MT of it US origin. The weather in Argentina continues warm & dry, whilst this will enable further harvest progress to be made, it may also continue to trim production estimates lower. Late harvested beans in Brazil's Rio Grande do Sul are also reported to be showing disappointing yields. Early calls for this afternoon's CBOT session: Corn futures are expected to open 2 to 3 lower; soybeans 8 to 10 higher; wheat 3 to 5 higher. Spot PK's in Immingham. The market's on fire. Check out the video footage on NoggerTV. A total of 12 fire appliances, including two aerial platforms, were sent to the scene as flames ripped through the ABP-owned Immingham Bulk Park building, on Alexandra Road, near the East Gate.. Eight years after starting Tremains Ltd, Ian Tremain leaves the business in the safe hands of BOCM PAULS and heads off on a Nuffield Farming Scholarship. The first part of the journey will take him to Kentucky to take part in the Alltech symposium, after this Ian will join the Nuffield Australia's world tour starting in Canberra and traveling through, The Philippines, China, USA, Canada, France and Ireland. Ian's topic is: "Agricultural commodities in a changing world". After this Ian will travel independently looking at the effects of growing world population and the renewed emphasis on renewable energy. Anyone wishing to see where in the world Ian is can follow his progress here. My chums at StormX offer an interesting insight into winter wheat crop developments today following last night's USDA ratings. Kansas wheat has made steady improvement with heavy rainfall over the past couple of weeks, while wheat has been progressing through the rapid-growth phase, they say. The important heading stage will begin next week with an ample store of ground moisture. Wheat is gaining back lost yield potential, after a long winter drought. A statewide average yield of 46 bushels per acre is possible, if the weather continues to be favourable. The crucial factor for Kansas wheat is that it was immature when a hard freeze developed in early April and did not suffer lasting damage, though development was set back for a time, say StormX. Wheat ratings have improved sharply in the past 2 weeks. As of April 25th, 48% of Kansas wheat was good-excellent, 37% was fair and 15% was poor-very poor. This was the highest condition report since last fall. Unfortunately, it's a completely different story in Oklahoma, where wheat keeps worsening in the aftermath of a hard freeze that developed April 7th. Crop ratings declined to 9% good, 27% fair and 64% poor-very poor on April 25th, down sharply from 3 weeks ago. Wheat in west-central and southwest Oklahoma was in the vulnerable booting stage when temperatures dropped to the low 20s F April 7th, leading to devastating losses where stems were damaged or killed. If water and nutrients cannot be transferred through the stems to the grain heads, kernels will never develop. Production is expected to shrink 35-50% in the affected crop districts, conclude StormX. May corn closed at $3.72 ¼, down 4 ¾ cents, off session lows of $3.62. Panic over the media coverage of the swine flu outbreak on Mexico got the market spooked today. All things considered corn put in quite a good performance considering that Mexico is the no 2 buyer of US corn. The weekly crop progress report was out this afternoon and showed corn planting at 22% this week compared to the five year average of 28% and last years same week plantings of 9%. That is a bit better than traders had feared. The numbers show a marked difference between East and West, with states like Iowa and Minnesota 47% & 40% done respectively, but Illinois and Ohio lagging at just 4% and 2% planted. May soybeans finished at $10.04 ¾, down 35 ½ cents, although they had been 20 ¼ below that at one stage. As with corn, swine flu was the big story of the day, it still needs to be said though that all the official agencies are at pains to point out that the disease cannot be contracted from eating pork products. So exactly why feed demand should be down the kind of magnitude that the market seems to thing is quite naive. Chinese demand remains robust and the crops in South America keep getting smaller, and old crop US stocks are already tight, plus nobody seems overly keen on buying from Argentina at the moment. Hardly bearish. The weekly crop progress report after the close showed bean planting at 3% versus the 5 year average of 5%. May CBOT wheat finished at $5.08, down 24 ¼ cents. As with just about everything else today swine flu drove the market lower 'just because'. Unlike corn & beans, wheat actually closed within a cent of session lows, yet the case for being bearish wheat based on swine flu only is not as strong. Winter wheat in the 18 states was rated 45% Good to Excellent and 27% Poor to Very Poor. That was an slight improvement from last week of two points in the top two categories and unchanged in the bottom two. Spring wheat is 15% planted compared to the five year average of 36% and last year at this time of 32%, that is five points behind what had been anticipated. Additionally top producing spring wheat state of North Dakota is just 1% done compared to 28% a year ago. EU wheat closed lower Monday, largely due to a knee-jerk reaction to the media coverage of the swine flu outbreak in Mexico. Although the outbreak started a couple of weeks ago, press reports escalated over the weekend, sending the overnight grains markets sharply lower Monday morning. EU prices followed the eCBOT market lower from the off today. Whilst the death of 149 people (as reported on the BBC news tonight) in Mexico is lamentable, we have to get this thing in perspective. There are 110 million people in Mexico, nobody outside the country has died from infection, two people in Scotland are reported to have mild symptoms of the disease and one person in Spain. Yes one person, in the whole of Spain. Hardly the epidemic or pandemic that the media are reporting. After almost three months of virtually no rainfall, the outlook in the UK and most of Western Europe has turned wetter this week, which should undoubtedly help wheat and rapeseed crops here. Paris May milling wheat closed down EUR2.00 at EUR139.50/tonne, London November feed wheat closed down GBP2.00 at GBP121.00/tonne. Robert Wiseman has announced that it will commence supplying to The Co-operative Group with an additional fresh milk volume from August 2009 equivalent to approximately 116m litres on an annualised basis. The Company currently supplies The Co-operative Group with circa 142m litres per annum across Scotland and the South of England, and has confirmed that it has been awarded the contract to continue with these supplies from August 2009. The additional 116m litres of volume will be delivered to The Co-operative Group's regional distribution centres in the North of England. "The Co-operative Group has been an important customer for many years, and we are very pleased to extend our relationship by supplying this additional volume. "We have an efficient and well invested network of dairies covering the country, a sound balance sheet and we move into the new financial year with confidence." Heavy showers and severe thunderstorms are moving out of eastern Kansas Monday morning, say StormX. Since Saturday, nearly 4” of rain has fallen near Topeka. In Wichita, remarkably heavy rain fell on Sunday, with a daily total of 5.10”, three of which fell in just 6 hours. The storm total there is over six inches. Across the state, several reports of tornadoes and large hail have been found. In the past month, an impressive turnaround in weather across Kansas has occurred as drought concerns have now evolved into flooding issues. In southwest Oklahoma where drought conditions still exist, some locales have picked up around a half inch of rain. Across the state, showers and thunderstorms should continue throughout the day, especially in eastern sections. By Wednesday, rain should return to the Southern Plains, lasting through late Friday or early Saturday. With the new USDA crop condition reports due out early this week, we will soon know if the rain helped to improve the wheat conditions across Oklahoma where 60% was reported to be poor to very poor last week. Experts are unanimously agreed that gold bars can't catch swine flu. Gold therefore is just about the only commodity that is up this morning. Just about everything else can catch it, or be affected by it, it would seem. Grains are down because pigs eat them. Crude is down because flights to Mexico are getting cancelled. Frozen concentrated orange juice is down because if we don't go on holiday then we won't drink any, apparently. I feel sorry for the manufacturers of those little tins of boiled sweets covered in icing sugar, nobody buys those unless they are going on holiday do they? Presumably the reason that GlaxoSmithKline shares are up this morning is in case they manage to cash in by inventing a cure for it whilst it's still hot news? If everyone in China stops eating pork where will we be then, eh? Just imagine that, that's what 1.3 billion people, lets say they eat half a pig per year, we don't really know, we don't really care. That's 650 million pigs, how much do they eat? Loads according to www.chinesepigseatloads.com. Suppose that we have to kill every single pig in the entire world because 103 Mexicans have died, and a few students have a bit of an upset tummy? Sell soybeans, crude oil, Suduko magazines, Ray Bans, Piz Buin, fake Rolexes and Fat Face flip flops. Buy gold and Linda McCartney vegetarian nut cutlets. And if my auntie had balls she'd be my uncle. The overnight grains closed sharply lower with beans down around 45 cents, and corn & wheat around 14-15 cents easier on concerns over swine flu. Worries that the outbreak of swine flu in Mexico will impact on demand for feed sent futures tumbling overnight. Soybean futures were close to six-month highs so I guess that some profit-taking was overdue, weakness in beans spilled over into corn & wheat. A wet outlook for much of the US Midwest this week may further delay corn plantings. The USDA will report on planting progress after the close tonight with corn expected at 15-20% done, whilst soybeans have only just started, with an anticipated 3% in the ground as of Sunday. Spring wheat may be around 20% planted, analysts say, that would be well behind normal for the end of April. The week ahead will see rain in all Corn Belt States, says Allen Motew of QT Weather. By the end of the week, the heaviest will have fallen in the West from Minnesota to Kansas. The East will see lighter amounts with the heaviest in Illinois and along the Ohio River Valley. Temperatures will average above normal in the East while remaining cold in the northern Plains of the West, he says. With traders saying that corn yields can drop by 1 1/2 bu/acre for every day past the May 15th deadline, it looks like some of the USDA's projected corn acres might end up getting switched to soybeans. In outside markets crude oil is around $2 1/2 lower at $49/barrel, and Wall Street is expected to open down as swine flu hits international travel, with airline shares down across the globe. Early calls for this afternoon's CBOT: Corn and wheat 12 to 15 lower, Soybeans 45 to 50 lower. No, not that one, I'm talking about Gustavo Grobocopatel, Argentina’s "soybean king" as the media love to call him - reputedly the largest farmer in the country. I'm sure that he probably hates being referred to as the soybean king, but he does seem to talk sense and raises some interesting points, for a man with a vested interest, at a meeting of the Argentine Productivity Movement (MPA). "Duties favour the concentration of land in a few hands because they don’t tax profits but revenue," he said, echoing claims by the liaison board formed by the leaders of the country’s four main farm lobbies: FAA, CRA, SRA and Coninagro. "With the duty system farmers continue to pay even when they lose money. Farmers who earn the least — that is, in the years that they actually earn money — get a lot less. And not only that system concentrates riches in a few hands, but also leads to a concentration in the richest areas." He also points out that government tinkering with export licence restrictions on corn and wheat last year are partially responsible for Argentine farmers planting less of those crops, thereby going "too soy". Lower wheat plantings combined with last years drought making it now "highly likely" that the world's fifth largest exporter of wheat in previous seasons may now have to import the grain in 2009, he said. Argentina is also the world’s largest supplier of sunseed, the second-largest of corn and one of the largest exporters of sorghum. Grobocopatel, whose company is called Los Grobo, said the drought is "terrible," adding that Buenos Aires province, the country’s richest, is heading to losing half of its harvest. Farmers estimate that the 2008/09 wheat harvest declined to eight million tons from 16 million last season and that the country may be even forced not only to import wheat but also corn and beef. A terrible disease is RAMPAGING across Mexico, sending SHOCK-WAVES around the globe. Commodity markets are PLUNGING on the news of the DEVASTATING effects of swine-flu is as the international PANDEMIC sweeps the ENTIRE WORLD in the grip of a CRISIS so ENORMOUS it has caused widespread PANIC on the streets. HOSPITALS are on stand-y for a TIDAL WAVE of new patients DESPERATE for a dose of the TAMIFLU ANTIVIRUS, their last hope of SALVATION. DON'T LEAVE THE HOUSE Mexico City residents are being warned and WEAR FACE MASKS AT ALL TIMES or face the highly likely possibility of a TORTUROUS DEATH before ye shall burn for all eternity in the fires of HELL. Commodity markets went into FREEFALL on the news, with soybeans CRASHING their daily LIMIT DOWN in China Monday morning. Oh yes. We've not had a good panic now for ages have we? Let's get some newspapers sold. Bird flu, pah. Salmonella in eggs, my arse. CJD and BSE are so yesterday darling. Blue ear, blue tongue, blue bollox. Already a GIGANTIC 0.000015% of the population at the outbreak's EPICENTRE in Mexico have been affected (yes I have done the calculation). That's affected, not died. If you want the DEAD figure you need to add another zero and to lop the five of the end. Nobody has actually died in America yet (or anywhere else outside Mexico for that matter), but a whopping 0.00000006% have already been affected, that's 20 people to you & me. And don't forget the Scottish couple in Lanarkshire, yes the DEADLY DISEASE is amongst us here too, with 0.00000003% of the population affected - although their flu-like symptoms are disappointingly mild and the couple's condition was causing little CONCERN. Bugger, I bet they're ginger as well. Four suspected cases have also been found in France. Let's keep our fingers crossed for them eh? It's only a matter of hours before the French ban Ben & Jerry's ice cream on the back of it, surely. Of course it doesn't really matter what I think, or even if I'm right, it's down the what the market perceives the threat to be. Currently, it seems, that the market thinks that this could have a serious affect on demand for corn & soymeal in the US. Indeed as with BSE and the Edwina-inspired salmonella in eggs scare in this country, although the reality of the threat to humans was tiny, scaremongering in the media was sufficient to sway public demand. We'll have to wait a few days to see how this one pans out.